Bridgewater, NJ- The Somerset Patriots of the Atlantic League of Professional Baseball are looking to hire a Hitting/Third Base Coach for the 2016 season. The position recently became available when Shane Spencer, who served as the Hitting/Third Base for the past three seasons, accepted the position of field coordinator and manager for the Nexen Heroes’ minor league system in the Korea Baseball Championship. Spencer helped coach the team to three-straight playoff appearances that included a division championship in 2013 and a league championship in 2015. The next coach will join a very successful and proven staff led by 2015 Atlantic League Manager of the Year Brett Jodie. “I’m looking for a hard-working, trustworthy guy that loves the game of baseball and wants to be in Somerset for the right reasons. The baseball experience and the ability to work with veteran hitters on the mechanical and mental side of the game is very important. But I also want a guy who understands who the Somerset Patriots are, represents us well on and off the field, and understands that this is a special place to be. Somerset is a great place to go for winning baseball and having fun while doing it. It will be one of the best stops in most people’s baseball careers,” said Jodie. The Somerset Patriots season will run from mid-April to early October. Opening Day is set for Thursday, April 21st at TD Bank Ballpark. The 140-game schedule will see the Somerset Patriots look to defend their sixth Atlantic League Championship. 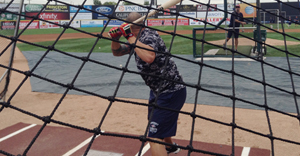 Individuals interested in the Hitting/Third Base Coach should contact Patrick McVerry, President/General Manager of the Somerset Patriots, by e-mailing pmcverry@somersetpatriots.com.